This small locomotive is actually a deisel-electric. I thought it would be fluid drive, or some other means, but it’s the same as the really big ones. 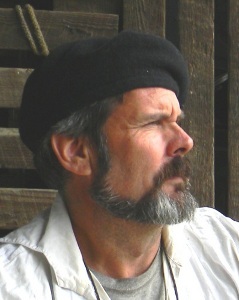 It is now a tribute to the American folklore legend john Henry, and is on display at the new Three Rivers Rambler depot. The gold in the center is 18 karat, the gold on the scrolls is almost pure, at 23 karats. The method of applying the asphaltum varnish is new to me; instead of the traditional brush method, this time I used an airbrush. I’m very pleased with the luminescent qualities that resulted. 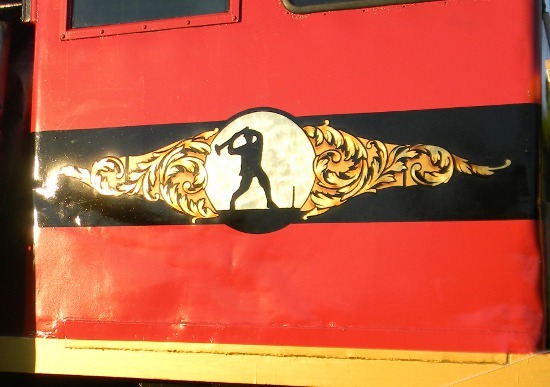 There is also a logo on the front of the locomotive, and stripes on the pilot; I’ll get a picture of that when I can.